Integrally or ‘through’ coloured concrete involves colouring the entire mass of concrete. This is usually achieved by the addition of synthetic mineral oxide pigments, commonly known as ‘oxides’ into wet premixed concrete during its batching and mixing preparation processes. A colouring pigment as a 100% effective colourant in powder form consists of ultra, ultra-fine solid particles. Unlike a dye that colours by a staining action from a dissolved solution, pigments are insoluble in most liquids including water and they colour concrete by masking the cement binder or matrix due to their exceptionally tiny grain size and as a consequence their vast particle surface area per unit weight or volume. The mineral oxide colourant type is UV resistant, has very high chemical resistance and is unaffected by weathering. Therefore, colouring concrete in this way is a permanent method. However, changes to the concrete or mortar themselves especially if of high moisture permeability, poor quality and durability in place may cause a change in the concrete’s colour. The precise concrete colour and its intensity will be determined by the pigment dose rate the efficiency of its mixing to adequately deagglomerate and disperse the ultra-fine pigment grains the colour of the cement, example: off-white or grey any admixture present and particularly the water cement (w/c) ratio. A thorough mixing action for 8-10 minutes in the pre-mixed concrete’s transit mixer at its mixing speed (18 rpm) deagglomerates and disperses pigment grains to optimise the colour of integrally coloured pre-mixed concrete and particularly its colour intensity and uniformity. Printed references for factors, which influence its colour as concrete changes from its wet, plastic to its set and later its hardened state during construction, such as concrete placement, compaction, formwork absorbency, formwork release agents, finishing techniques and curing methods are provided below. Concrete is an essentially inorganic, mineral composite material. Its binder is cement paste (cement and water) which sets quite quickly (2-5 hours depending on the pre-mixed concrete grade/class and its temperature and hardens over time to bind its constituents of coarse and fine aggregate together into a dense coherent mass. Strength and durability characteristics are derived from the slow chemical combination of the water with cement over about 28 days - referred to as hydration - to result ultimately in hard, highly durable inorganic calcium, aluminium and iron silicate binders as well as calcium hydroxide, which gives concrete its inherent alkalinity. Mineral oxide colouring pigments have a negligible effect on concrete strength. In most cases of use, mechanical strengths are increased slightly - especially at the same water:cement ratio. Although mineral (metal) oxides occur naturally in some soils and rocks, provided they are thoroughly mixed into concrete, those that are synthetically produced are preferred to natural versions for normal use in architectural and functional delineation coloured concrete since they provide more economical, uniform and stronger colouring potential. For integral or through concrete/mortar colouration, an oxide pigment can be added at the concrete’s mixing stage or for surface colouring, combined with cement and fine aggregate such as a suitable artificial sand, and broadcast onto the surface of freshly placed concrete as a dry ‘shake topping’ mix (sometimes referred to erroneously as a colouring dry shake ‘hardener’) and floated into the surface. For through-coloured concrete which is considered more colour durable than the dry shake method, the use of too little pigment, an inadequate degree of mixing and excessive water contents, are sometimes the cause of inconsistent colour. Typically, a dosage rate between 4.5% to 8% by weight of the concrete’s cementitious binding material and its thorough mixing for (8-10 minutes at mixing speed in the barrel of the transit truck) with a conservative water:cement (w/c) ratio provides the best results and the manufacturer’s recommendations for successful use should be followed. Compared with other types, mineral oxide pigments are very opaque (nontransparent) and at the dose rates quoted above with thorough mixing can provide uniformity and intensity of colour to effectively and permanently mask some deleterious effects attributed to irregular raw materials and construction techniques. For intense, dark or pale tones, the pigment concentration may reach saturation point before the desired colour intensity outcome is achieved. In such instances, the modification of the concrete’s mix design by increasing the size of both the coarse and fine aggregate to lower the water demand for a given liquid consistency or ‘slump’ and/or to lower the water:cementitious material ratio by means of a suitable water reducing admixture(s) may be critical in obtaining the desired result. The lower the w/c ratio with a given dose of pigment the stronger the colour. inorganic Portland cement powders. These are hydraulic and when mixed with water set and slowly harden to produce a tough, hard, durable binding material. Portland cements are available as grey, off-white and white powders and each of these will with the same colouring pigment, and amount differently affect the colour of integrally coloured concrete. General Purpose (GP) and General Purpose Blended (GB) grey un-pigmented cements are manufactured by burning limestone, clay and sand in a special kiln and grinding the resulting lumps after cooling (called clinker) to a fine powder. The colour of a dark grey Portland cement is usually due to a relatively high iron content and/or the controlled addition of supplementary cementitious materials (SCMs) such as fly ash. A light grey colour may result from a low iron content and/or a relatively high content of white ground granulated blast furnace slag powder. Although grey cement is not colour controlled during manufacture, it is suitable for use when dark or subdued concrete/mortar/grout colours using oxide colouring pigments are required. White and off-white cements have lower iron contents than grey cements and are favoured for architectural coloured concrete since they contribute to the appearance of a cleaner, brighter colour. White cement offers the greatest potential for high colour saturation and cleanliness/ brilliance of tone - often an enhancement of Class 1 finishes - but since it is sourced from overseas, can be considerably more expensive than grey cement. The long delay in arrival after placement of an order for white cement offshore may also cause it to be stale, partially hydrated and lumpy. Further, it is invariably only available in 40kg or 94 pound net sacks which is inconvenient and more costly for use in pre-mixed concrete supply than the convenience and rapidity of use with bulk silo storage. The invention of Off-white cement (OWC) by Mr Ken Flemming at the Brighton Cement Works in South Australia’s, Barossa Valley in 1967, an important product which is now produced by virtually every cement manufacturer in Australia, is colour controlled during production. It is available in a fresh state, not overly expensive and offers an excellent economic solution for clean, bright, colour shades in effectively pigmented concrete. The off-white colour of OWC can be made whiter by adding the white pigment Illumin-ite White, a Titanium Dioxide white pigment which features a high refractive index. This confers an ability, to prevent hardened concrete or mortar from being dulled by water such as when rain water falls against a building’s facade. Aggregates are inert granular or pebble rock constituents of concrete, which accounts for up to 80% by volume of a mix batch. Most coarse and fine aggregates such as basalts, quartz, granites, porphyries, cherts, marbles and sands are obtained from natural sources, although manufactured and recycled materials are used currently and are becoming more readily available. Without colouring pigment the colour of the aggregates, and particularly the fine aggregates, affects the colour of concrete. For instance, ‘jet’ black concrete may be effectively produced using a very dark coloured aggregate such as black granite, which is carefully scale graded from 14mm chips down to a fine dust in ideal proportions. As added insurance in obtaining an intense black concrete or terrazzo, a suitable dose rate of a high colouring strength black iron oxide pigment could be included. A bright ‘white’ concrete may be easily made by using off-white cement, light coloured coarse sand with white or pale coloured pebbles or crushed quartz or quartzite coarse aggregates, plus a suitable dose of an ideal grade/class of Titanium Dioxide, Illumin-ite White pigment. The proportion between fine and coarse aggregates influences the colour outcome of architectural concrete finishes to a slight degree, with fine aggregates having the more significant colouring presence in formed, trowelled, and particularly lightly abraded decorative concrete surfaces. The colour of the coarse aggregates will dominate in concrete surfaces, which have been subjected to special finishing effects such as heavy abrasive blasting, water washing to expose the aggregate at the surface, tooled finishes or honing and polishing, and often as a result pigment dose rates may be reduced for these types of finishes. The specified water:cement (or cementitious material), (w/c) ratio in concrete must remain consistent for uniform colour - particularly when low dose rates of pigment are used! Changes in the w/c from batch to batch of concrete may result in colour variation, which could be unacceptable. Concrete, which is diluted on site by the unauthorised addition of uncontrolled water, will, apart from suffering lower hardness, strength and durability, often result in concrete being paler and lighter than expected and/or having mottled colours. This water-weakened concrete will have lower strength, be less hard and wear resistant, easily erodible, more absorbent and permeable to water, degrading chemical solutions and other liquids, more likely to suffer rusting of its steel reinforcement to cause concrete cancer and be subject to greater shrinkage and therefore will be more likely to crack in places other than under the tooled or sawn joints, which visually disguise cracks. Today concrete may be produced in virtually any colour, which may be intended to be functional - as in reducing light reflection – and particularly colour delineation projects - or purely decorative. However, the properties of concrete raw materials will vary between suppliers and in order to minimise colour variation, the cement, aggregate and particularly the pigment should be specified to be supplied from single sources. Project specific architectural sample test panels are highly recommended to be provided by the contractor for the approval of the landscape architect, architect, building designer or other specifier prior to the commencement of a project. Architectural samples are often considered critical in determining the construction influences on the final colour and finish of the in-place concrete. Coloured concrete applications should be specified with the prefix ‘S’ for Special Class concrete to AS1379–2005 ‘The Supply of Concrete’ and AS3600-2005 ‘Concrete Structures’. AS3610-1999 ‘Formwork for Concrete’ provides guidance for the colour and quality of finish assessment of standard grey coloured, un-pigmented concrete, bound with grey cement. It may however be considered a useful base to establish the core specification for coloured concrete using pigments, as denoted in this Standard by the suffix ‘C’. 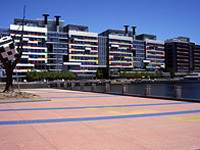 The Cement Concrete & Aggregates Association of Australia’s (CC&AA’s) Technical Data for integrally coloured concrete includes: Briefing Note 1: Colouring, Stencilling and Stamping Concrete Flatwork. Briefing Note 3: Colour and Texture in Concrete Walling; and the Concrete Panel Homes Handbook, July 2001.